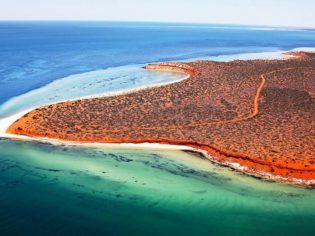 Road tripping your way from Perth to Ningaloo Reef is a bucket-list item all on its own, and it doesn’t have to cost an arm and a leg. At just under 1200 kilometres, this west coast drive takes you from Perth to Exmouth along WA’s stunning Coral Coast via Cervantes, Geraldton, Monkey Mia and Carnarvon. Where the turquoise Indian Ocean meets the rugged outback, is there a more breathtaking sight? With the Pinnacles Desert, World Heritage Shark Bay, swimming with dolphins, manta rays and whale sharks, and the dramatic gorges of Kalbarri National Park, this is Mother Nature at her finest. Enjoy sneak previews of cerulean blue sea peeking through beautiful countryside vistas as you head north on Indian Ocean Drive, alongside the coastline. The views will turn to green farmland then brush before you arrive at Geraldton. The city has an inviting shopping district by the water with restaurants and beachy shops, and is a good place to fill up on supplies that will become scarce on the way north. If you’ve got time to kill, the HMAS museum makes for an interesting afternoon. But stocking up for the journey is a bigger priority! Traveller’s tip:There are plenty of great seafood restaurants here – make the most of them. $$: Like the rest of the Mantra hotel chain, its Geraldton outpost is modern and spacious. $: Sunset Beach Holiday Park is on the beach at the north end of town, offering easy access to a decent IGA, a beautiful, rugged beach and a great view of the sunset. Between Geraldton and Carnarvon the landscape changes from farmland and rolling hills to a more arid, desert-style landscape (look out for the many emus, feral goats and cows). Approach the town through the orchards and stop off at Morel’s for some dried fruit, fresh fruit ice-cream or veggie supplies for your evening meal. The region is known for its thriving seafood industry, and Pickles Point Seafood & Boatyard is the perfect place to grab some prawns or crayfish to cook up later (or eat in their on-site restaurant). Drive down to the photogenic One Mile Jetty and walk, or take the short tourist train, to the dock’s end where sharks and turtles can sometimes be seen in the area’s trademark clear waters. Carnarvon is the last spot to stock up on meats and produce before prices skyrocket and availability plummets further north. Coral Coast Tourist Park has the best location (the only park within walking distance of town) but other parks further out offer nicer facilities and sites. $$: The Best Western Hospitality Inn is comfortable and well-run. $: The Wintersun Caravan and Tourist Park is new, nicely laid out and has a great family vibe. The drive between Carnarvon and Exmouth is wonderfully flat, red and vast. Look out for alien-like termite nests that dot the landscape in huge numbers along Minilya-Exmouth Road before you hit Exmouth, which has two competing IGAs (with limited stock – take note! ), a handful of restaurants and hotels, and some souvenir shops. It’s here that boats heading out to dive with whale sharks depart between April and July, and humpback whales grace the waters between July and November. Grab lunch and supplies before heading 13 kilometres north to child-friendly Bundegi Beach, which marks the start of the Ningaloo Marine Park. If you’re taking a whale shark tour, organise it in town for tomorrow. If you’re a diver, check out the Navy Pier – it has been named one of the world’s top 10 on-shore dive sites. You can snorkel sections of Ningaloo Reef (minus the crowds) at Bundegi Beach. It’s also fairly common to spot breaching whales here between July and November, not far offshore. $$: If you can’t justify splurging on Sal Salis but still want to be on the beach, try Mantarays Ningaloo. $: Ningaloo Lighthouse Caravan Park is not only located on a picturesque peninsula, it’s halfway between Exmouth and Turquoise Bay – a strategic choice for getting a jump start on the tourists when you want to visit Turquoise Bay in a couple of days. Today’s the day – get ready to swim with the whale sharks (and turtles, and manta rays, and more). Take in the spectacular views of the reef from above as well, with Ningaloo Reef Air. Expect to see manta rays, dolphins, dugongs, sharks, and whale sharks when in season, as well as the stunning turquoise coastline. Say yes when your tour guide offers you a wetsuit – not only because they offer protection from sunburn and stingers, but because they do a wonderful job of keeping you warm between swims on the boat. Rise early(ish) to complete the one-hour drive to Turquoise Bay, a gem in the Cape Range National Park. The magnificent waters of Coral Bay, WA (photo: Elspeth Velten). Alternatively the ‘Bay’ car park offers calmer waters and snorkelling for beginners. From there, return to Exmouth and take the two-and-a-half-hour drive south to Coral Bay – a one-street, palm-fringed oasis surrounded by desert and a gorgeously long, child-friendly beach. Walk to the left and around the cliffs before wading into the water to snorkel – like in Turquoise Bay, gentle currents carry swimmers back towards the centre of the beach. Coral Resort Bakery is a true, old-school spot with – dare we say it – the best pies on the west coast. Reef and beef (that’s beef and prawn) is the winner. $$: Ningaloo Reef Resort is comfortable, clean and right on the beach. All you need! $: Peoples Park Caravan Park is a bit more expensive than Bayview next door, but has better facilities and grounds. Call early to reserve an ocean-view spot, but anywhere on the tree-spotted, grassy grounds makes a decent place to stay. Plonk yourself here for an extra day (or two). Aside from hitting the beach, you can take diving and boat tours or go quad biking on the sand dunes and beach. If you’re self catering, plan ahead – there’s no more than two caravan parks, a hotel, a backpackers’ lodge and a handful of small shops. Swim with manta rays with Ningaloo Marine Interactions all year round. Walk to the right of Coral Bay’s beach, to Skeleton Bay – a reef shark nursery where, if you wade in no further than your knees, you’ll find yourself surrounded by (harmless) shark pups. 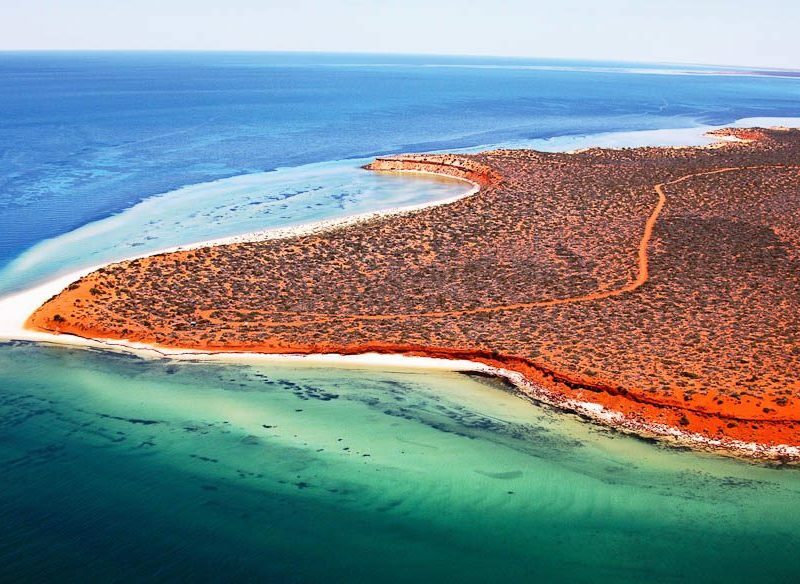 The World Heritage-listed Shark Bay, WA. The drive to the sleepy town of Denham in Shark Bay is the longest of the trip, so stop off at Carnarvon for lunch. Afterwards, look for signs for the Hamelin Pool after taking the turnoff for the Shark Bay World Heritage Drive. This shallow bay is home to ancient structures made by cyanobacteria called ‘stromatolites’, which are considered living fossils. These particular stromatolites are over 3000 years old, form one of the only prospering communities left in the world today, and are quite pretty to see. Stop at Shell Beach, a white strip formed entirely from tiny cockles, just south of Hamelin Pool. Stock up on food again at Carnarvon because the supermarkets from here are again sparse. $$: Heritage Resort is smack bang in the centre of town but still has great views of the water. Rooms are nice and big. $: Denham Seaside Tourist Village has a spacious kitchen and is right on the beach with beautiful views of the sunset. Come morning, head to the Monkey Mia Dolphin Resort (about 30 minutes from town) to take part in the daily dolphin feedings that occur on the shore. Park rangers explain the process at 7:45am, and up to three feedings take place between 8am and noon, depending on when and how many dolphins come in to shore for a snack. The interaction can be crowded early on (and can, to be honest, be a bit touristy – though great for kids), but after the initial feeding, the crowd thins out. Wander further down the beach and explore the shallows for photo-ops with starfish, seashells and red dunes, and keep an eye out for emus – they often come down to the sand for a bit of sun. On the way back to Denham, check out the Little Lagoon, one of a few birridas in the region that opened up to the sea thousands of years ago. Dolphins are visible up and down the beach before and after the feedings at Monkey Mia, so a walk away from the crowds can often yield your own sighting. During the spring, scan the roadsides between Shark Bay and Kalbarri for blooming wildflowers – the area is known for them. En route to Kalbarri National Park from the town of Kalbarri, the Mushroom Rock Walk showcases stunning ancient rock formations as you wander down a gorge, while short walks further down the coast give way to not-to-be-missed gorges, Island Rock and Natural Bridge. It would be very easy to spend days here but in a time crunch, spend half a day at the national park checking out The Loop walk (accessed via the quick Nature’s Window walk). Huge pelicans are fed every morning just outside of the Murchison River Caravan Park, and whale watching and river cruise tours leave from town daily. To cater your own seafood dinner, grab some fish at the Jetty Seafood Shack. $$: Kalbarri Edge Resort is lovely and modern (the wi-fi is fast, too). Upgrade from a studio to a two-bedroom apartment if you need a laundry. $: Murchison River Caravan Park is convenient to town and landscaped with beautiful flowering trees… though when we visited, the kitchen was patronised by roaches. Eat elsewhere! Scenic walks in Kalbarri National Park lead to lookouts with views over deep gorges, trickling streams, and lush redgums contrasting with red sandstone. The town of Cervantes doesn’t offer a lot in the way of entertainment, but it’s the closest centre to bucket list item the Pinnacles, located in Nambung State Park. Stop at Geraldton on the way back for a quick refuel and lunch stop, then at tiny towns on the way like Green Head and Jurien Bay, which offer beautiful waterviews. Then head to Cervantes. The Pinnacles are best viewed in certain light, so drive to Nambung National Park around sunset or sunrise the next morning. Park and take a walk around the strange rock formations, and then do the drive around the park to understand the grand scale of things. Playful sea lions rule the waters of the marine park here and daily tours are offered. During crayfish season (November–June), Cervantes and Jurien Bay are bustling with fishing industry insiders, and are great for a fresh helping of seafood. Ask about wildflowers at Nambung National Park – guides will know where the blooms are prolific and if your timing is right. $$: Cervantes Windbreak Bed and Breakfast is spotless and exceptionally well-run, but you’ll need to book in advance – there are only three rooms. $: Cervantes Pinnacles Caravan Park is the only one in town, and is just on the beach. It has a great little café, offering a decent breakfast. Leave Cervantes for Perth early and stop at Yanchep National Park to see koalas relaxing in their eucalypt home along some good bush walking trails… or sleep in, and make your way back to the big smoke as slowly as you like. • Supplies north of Carnarvon become limited and more expensive, so if you’re self catering, stock up on food beforehand. • Pack snorkelling gear! But don’t fret if you forget it – you can rent gear at several places (most notably at Exmouth Dive Centre). Many accommodation providers also have spare sets available for guests. • It’s recommended that you don’t drive at night, to avoid collisions with the prolific wildlife. Some car rental companies will also make it a condition of lease that your hire car is not driven after sunset. Always good to visit Gnaraloo in that trip. Incredible surfing and unbelievable scenery. One of the most beautiful beaches in the world in Gnarloo Bay. It’s where the ningaloo reef properly starts. Camping and fixed building accommodation is available. I think there’s plenty more that could go on this list but agree with Steve that Gnaraloo would be a worthwhile contender, along with Red Bluff that’s along the way. Unfortunately like everything else along this lonely stretch of coast, it’s a detour, being 150km north of Carnarvon but for those feeling a bit adventurous and who have a sturdy vehicle this is a worthwhile detour. This trip is definitely on our bucket list. We will do it sooner than later.